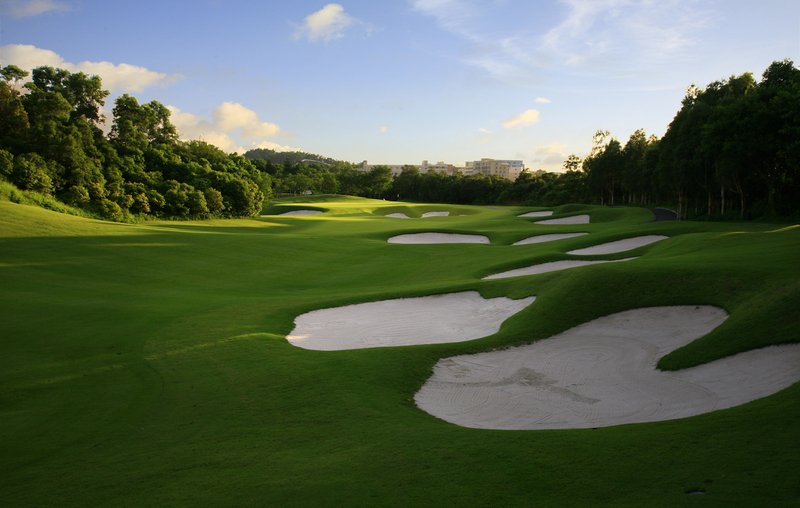 Although there are many golf courses in and around Guangdong, the lack of high-quality private courses in this area has always been a source of great frustration. One of the very rare finds in these parts is the Genzon Golf Club, an exclusive 36-hole establishment located a short drive northeast of Shenzhen. Both the A and B Courses at Genzon were designed by Neil Haworth and his company, who set much of their golf around an enormous internal lake that dominates the view from the clubhouse and is integral to the composition of both layouts. Each course starts on the inland side of the main entrance road, but works its way back to the central property and ends with closing holes set right alongside the banks of the lake. The superior A Course not only has more space and strategy than the B, but a number of non-water holes that are the equal of those along the lake. The highlight of the course is the routing and the clever use of the lake within design. With the exception of the first three holes, the opening 12 essentially loop counter-clockwise around the outside perimeter of the property, before doubling back and playing clockwise along the northern bank. Interestingly, the 15th, 16th and 17th occupy an island within the lake, while the 18th returns to the clubhouse along its eastern shore. There are a couple of long transition areas here, but the flow between holes creates the sense of this being a natural way to maneuver through the property. With the exception of a couple of flat spots, the most pleasing aspect of the A Course at Genzon is the designer’s shaping of both the playing corridors as well as the peripheral golfing areas. Where on projects past they might have built containment mounds and catch basins, here they instead moved earth to create realistic crests, saddles and shallow plateaus. The use of mature oak, lychee and pine trees, together with abundant indigenous plantings, adds further to the sense of maturity and authenticity.